The CleanFinancial.com guide to S&P 500 spread betting. Where Can I Spread Bet on the S&P 500? Where Can I Trade the S&P 500 for Free? Where Can I Practice Trading the S&P 500? How to Spread Bet on the S&P 500? Note: Rather than being called the S&P 500 or just S&P, in spread betting and CFD trading, the index is often called 'SPX', 'US 500' or 'USA 500'. Note that you may be able to speculate on the S&P 500 using other platforms. The latest COT Report (Commitments of Traders) for the S&P 500 futures market has been released by the CFTC, please see our S&P 500 COT report below. Where Can I Find Live Prices and Charts for the S&P 500? We do show readers pretty accurate S&P 500 prices, please see above. The live chart below will also give readers a useful insight into the American stock market index. The contracts for difference chart above usually tracks the underlying S&P 500 futures market (not the daily market). To analyse live financial spread betting charts/prices for the S&P 500, you might require a spread trading account. You can also use a spreads account to access the shorter term spot markets. Readers should note that accounts are normally dependent on status, credit and suitability checks. If your new account is accepted, you will be able to log on and view the live charts and prices. On most platforms, these are free. Having said that, you could get the occasional email or sales call from the relevant firm. Of course, if you decide to trade then, before starting, you should note that CFD trading and financial spread betting carry a significant level of risk to your funds and losses can exceed your initial deposit. Advert: S&P 500 Spread Betting, sponsored by FinancialSpreads.com. You can spread bet on the S&P 500 with Financial Spreads. Where Can I Spread Bet on the S&P 500 for Free? Investing always involves a degree of risk. However, if you'd like to try a completely free Demo Account, where you can look at spread betting charts and practice trading, please see below. When deciding which investment option might work for you, also remember that spread trading in the UK is tax free*, i.e. it is exempt from capital gains tax, stamp duty and income tax. Each of the above firms provide a 'Demo Account' that gives users the opportunity to try spread betting, test new ideas, practice with an array of orders and use charts. As with most key markets, you can spread bet on indices, like the S&P 500, to either rise or fall. When you spread bet on the S&P 500 index you trade in £x per 0.1 points. So if you have a trade of £4 per 0.1 points and the S&P 500 moves 2.2 points then there would be a difference to your P&L of £88. £4 per 0.1 points x 2.2 points = £88. Be aware that this is a Rolling Daily Market and so unlike a normal futures market, there is no settlement date. As a result, if your trade is still open at the end of the trading day, it simply rolls over to the next session. Then you may decide to go long of the index at 1436.3 and risk, for example, £3 per 0.1 points. 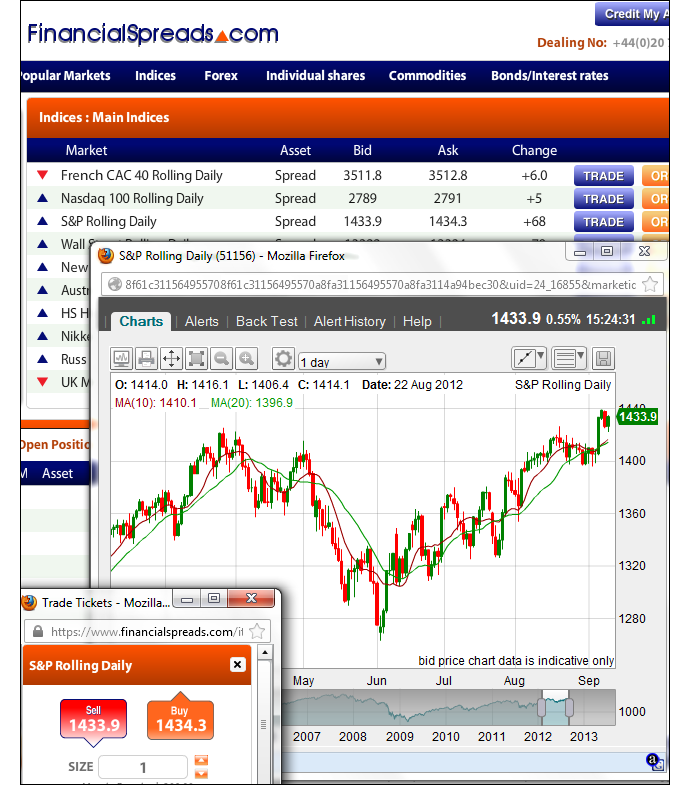 This trade means that you win £3 for every 0.1 points that the S&P 500 index rises above 1436.3. Nevertheless, such a trade also means that you will make a loss of £3 for every 0.1 points that the S&P 500 market decreases below 1436.3. Put another way, if you ‘Buy’ a spread bet then your profits (or losses) are found by taking the difference between the closing price of the market and the initial price you bought the spread at. You then multiply that difference in price by your stake. As a result, if after a few sessions the US stock market moved higher then you might want to close your position so that you can secure your profit. Speculating on the American stock market, whether by spread betting or otherwise, does not always go to plan. In the above example, you wanted the index to rise. However, it can also fall. If the S&P 500 market weakened, against your expectations, then you might decide to settle your spread bet to stop any further losses. Note: S&P 500 Rolling Daily spread betting market taken as of 21-Dec-12. On the settlement date for this 'March' market, 15-Mar-13. Again, if you speculate on the S&P 500 index you trade in £x per 0.1 points. As a result, should you decide to risk £3 per 0.1 points and the S&P 500 moves 2.2 points then that would make a difference to your profit/loss of £66. £3 per 0.1 points x 2.2 points = £66. Then you might decide to go long of the US market at 1428.0 with a stake of, for the sake of argument, £3 per 0.1 points. With this contract, you gain £3 for every 0.1 points that the S&P 500 index pushes higher than 1428.0. However, such a contract also means that you will lose £3 for every 0.1 points that the S&P 500 falls below 1428.0. In other words, with spread trading, when buy a contract, your P&L is calculated by taking the difference between the price the market expires and the price you bought the market at. You then multiply that difference in price by your stake. Having said that, trading American stock market futures doesn't always go to plan. In the above example, you wanted the US index to rise. Of course, the index could drop. If the S&P 500 fell and closed lower at 1424.0, then you would end up making a loss on this contract. Note - S&P 500 March Futures taken as of 27-Sep-12. Where can I spread bet on S&P 500 Companies? How to spread bet on American shares? 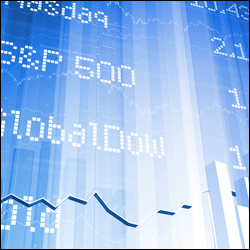 Rather than being called the S&P or S&P 500, in financial spread betting and CFD trading, the American index is often called 'US 500', 'USA 500' or 'SPX'. The S&P 500 defines the broader US equities market. An index tracking the performance of the top 500 US companies. S&P indices have over $1.53 trillion in indexed assets. The history of the S&P 500 dates back to 1923. It expanded to 500 companies in 1957. This index is maintained by the S&P Index Committee which includes Standard & Poor's economists and index analysts. For the latest view on the stock market see Daily Market Review. Below, an older but still useful case study on the US stock market by Shai Heffetz, InterTrader, 29-Jun-2011. The S&P 500 has been widely used as a bellwether for the US economy ever since it was published for the first time in 1957. It is an index of the top 500 companies in terms of market capitalisation trading on the NASDAQ and New York stock exchanges. The index has been in a relatively strong bull market since September 2010. This started to lose momentum at the beginning of March and since then the market has moved mostly sideways. On 3 June 2011, it closed below the Ichimoku cloud for the first time in quite a while, indicating that the bull run has finally been broken. On 6 June the S&P 500 formed a new low of 1285.90 and continued to trade generally downwards, forming a new low of 1264.90 on the 15th of June. Currently the market is somewhat directionless, as can be seen by the fact that the blue Kijun Sen line in the chart below has turned flat. The big picture on the technical analysis remains bearish, however. The green Chinkou Span line is well below the price of 26 periods ago and the price is below the green Ichimoku cloud, whilst the red Tenkan Sen line is also below the blue Kijun Sen. All this adds up to a clear indication of a short-term downturn in the price. Some analysts believe the price is forming a double bottom before heading up again. This will only be confirmed if the price breaks upwards through the Ichimoku cloud in the near future, which is currently quite far away at 1332.95. Any move below the recent low of 1257.90 will be a clear indication that the bearish sentiment is winning on the S&P 500 market and we could soon see new lows. S&P 500 financial spread betting guide with a price comparison and daily analysis. Plus live S&P 500 charts & prices, where to spread bet on the stock market index commission-free and... » read from top.